Choosing Color For Stamped Cards eArticle Now Available! How do you choose colors for your stamped cards? Do you randomly grab colors you like and hope they will go well together? Or do you stamp and color something and then hold it up to one piece of background paper after another until you find a color combo that appeals to you? Or do you play it safe by always reaching for the same few colors that you know work well together? Want to broaden your color choices? 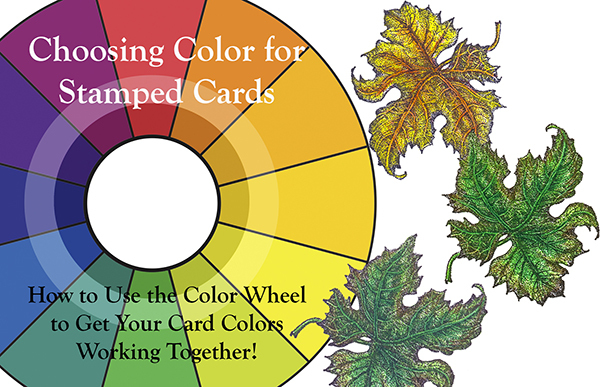 The newest VSN eArticle focuses on using traditional color scheme models and either print color wheels or free online color wheel-based tools to choose colors that work well together for stamped cards. We not only look at color scheme theory, but also explore examples of cards that start with the same image completed in a variety of color schemes. You have the tools to choose fresh, interesting color combinations for your stamped cards. And you just may be surprised at how easy and quick the process can be. This is an EXTRA unsponsored eArticle. That means that there is a cost (a very, very small cost!) to purchase it: 99 cents. This may not seem like much, but your purchase helps me cover the costs of putting together eArticles and keeping up the website and online shopping cart.